Panini's second NASCAR effort came out recently, the NASCAR-only brand Torque. 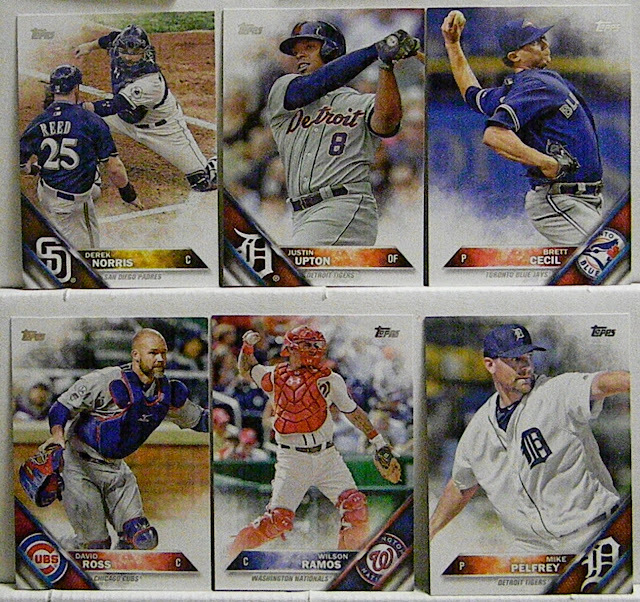 Featuring a 100 card set, the brand is available in hobby boxes and as 8-card retail blasters, which guarantee a hit of some sort. That is what I opened and will be covered here. 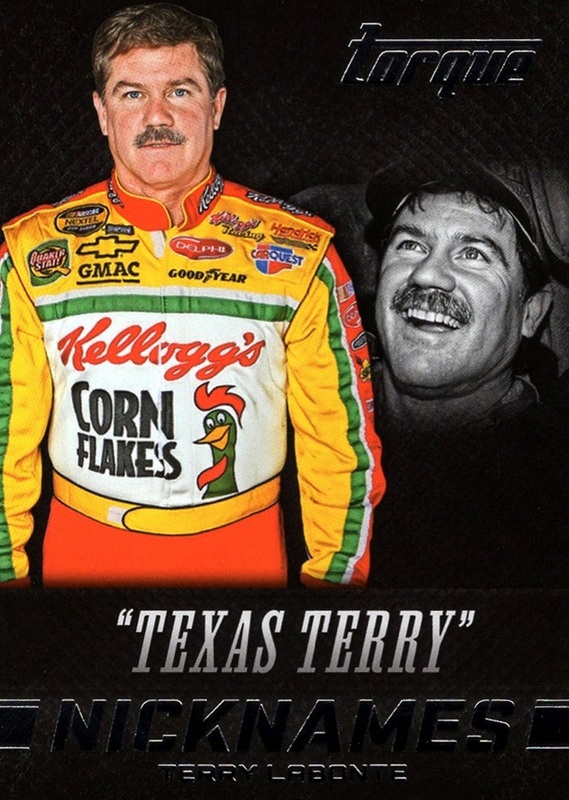 The cards are very dark and most feature staged photos from the annual photo shoot held in Daytona every February. (the same source for most of the photos in Prizm, also). 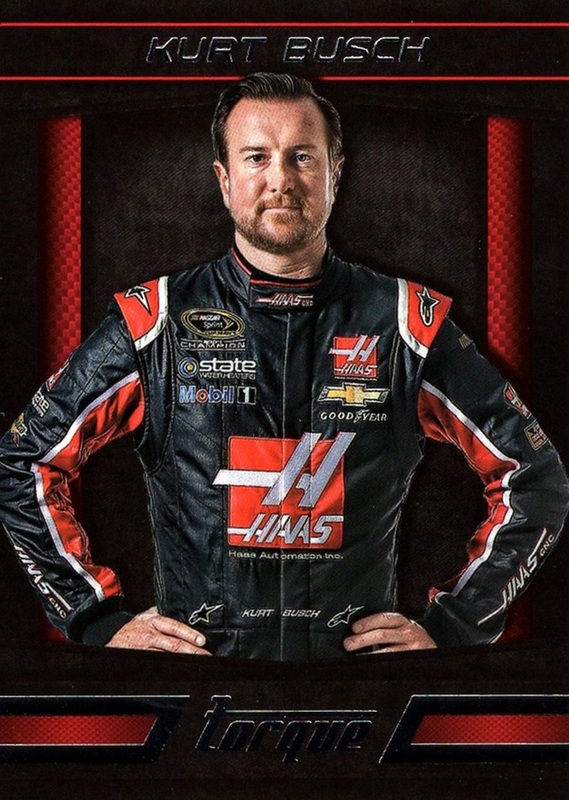 Kurt Busch made it to the round of 8 in the Championship this year. John Wes Townley is a rare person to see on cards- this is only the second card of him in my collection. 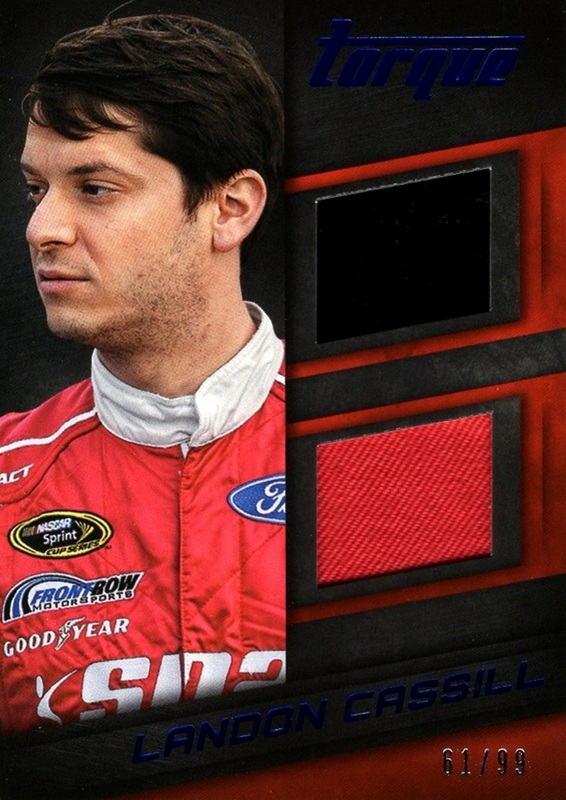 He's one of the least popular drivers in all of NASCAR...both among fans and other drivers. Although he has gotten better recently, he has a tendency of crashing...often. 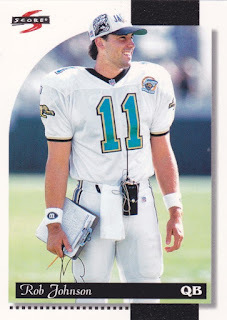 At one point he was even fired by the team his family footed the bill for due to poor performance. 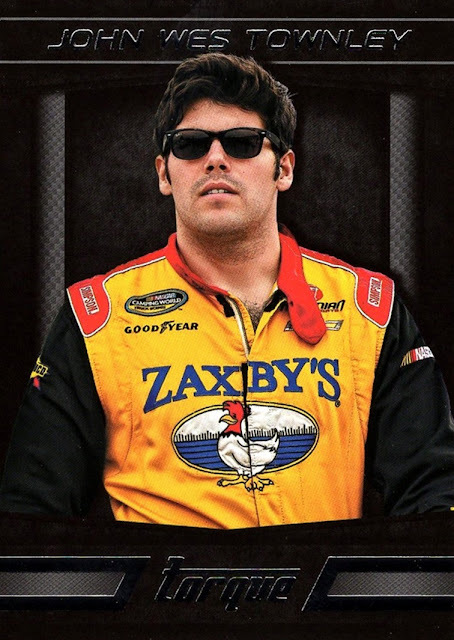 His father owns Zaxby's. Regan Smith is the most recent driver from the state of New York to win a Cup race, which he did in 2011. 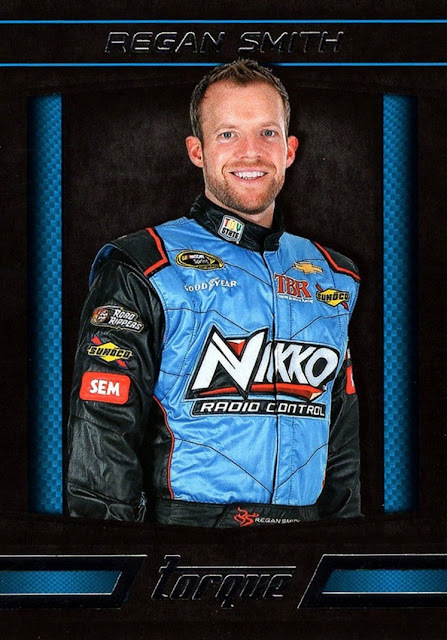 Tommy Baldwin Racing, which he drives for, may have gone out of buisness at the conclusion of 2016, it's unclear yet if the team will return one of it's two cars or none. This is an insert, even if it looks more like a subset. The color photo is from 2005, the black and white photo is from 1998. Labonte was a regular in Cup from 1978 through 2004, then ran a partial schedule from 2005 through 2014. 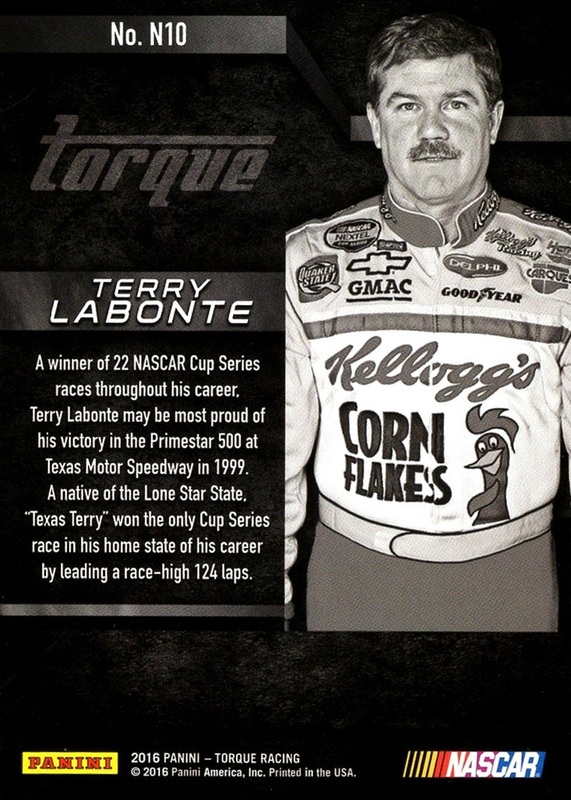 He won the 1984 and 1996 Cup Championships. I was surprised to pull this serially numbered insert parallel from a retail pack...Johnson won his record tying 7th Championship this year. My promised hit. 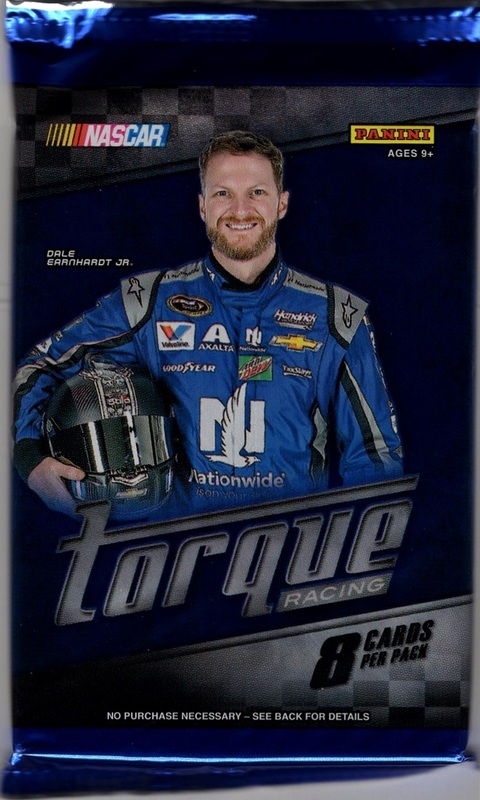 This is the blue parallel of the Dual Relic insert, and although Panini can't be bothered to tell us what kind of material we are getting, it's a piece of sheet metal and firesuit. 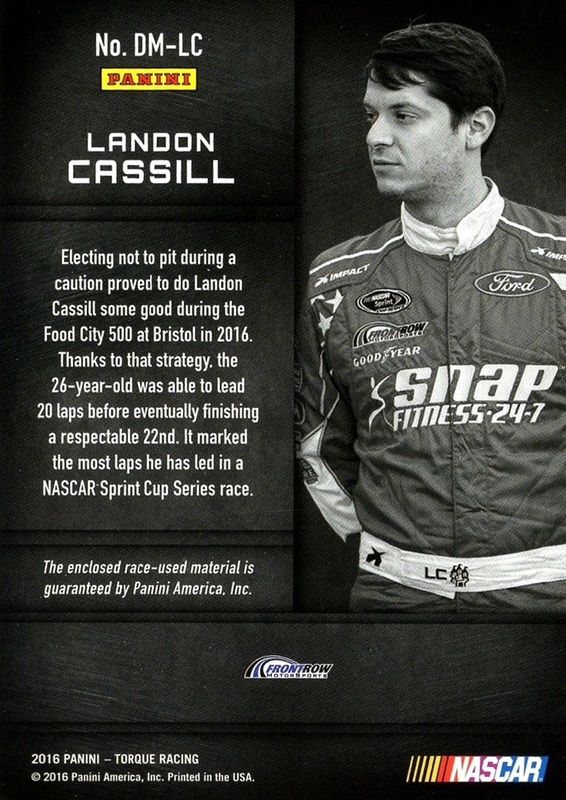 Cassill is a card collector himself, and even had a TV segment about his card collection several years ago. Like myself, 1991 Maxx is his favorite set as well. 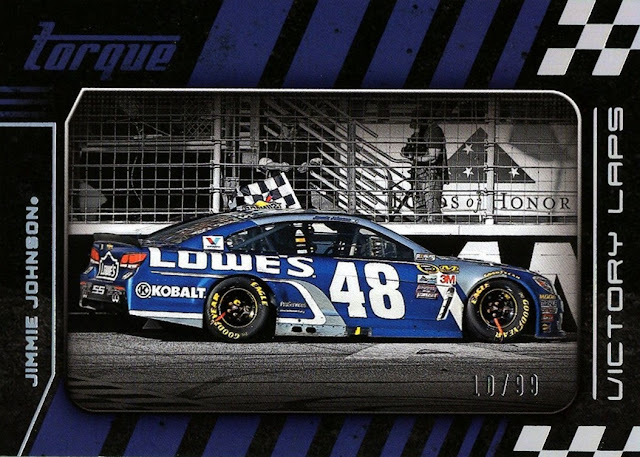 One thing I really like about Panini's offerings is that they give us cards of cars...although only a handful, it's better than what Press Pass did, which was usually no car shots at all. 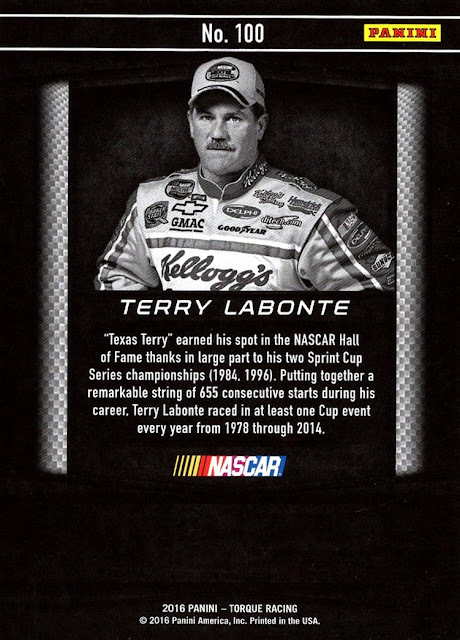 Terry Labonte's base card- the final card in the set- looks very similar to his Nicknames insert, probably because the photo was taken from the exact same photo session. 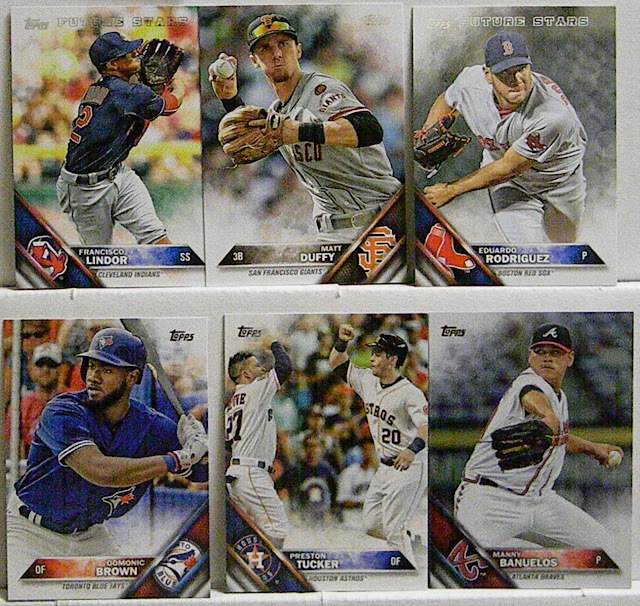 Even the insert backs are pretty much the same. Since the cards are so overwhelmingly dark gray to black, most of them came out of the pack with some minor chipping along the edges, especially the bottom edge. These cards are not going to age well due to the overall darkness of the cards. Even so, I'm still happy to have added the set to my collection, and I would not mind getting more. Let me first apologize for the crappy photos. My scanner is packed up and in storage so this is the best I can do for the forseeable future. Anyway, I picked up this Power Up starter set at my last trade night at Bosco's here in Anchorage. Couldn't pass up the pack for a dollar. I was hoping to pull a Favre or some other Packers for my team set. Let's see what was in the box. 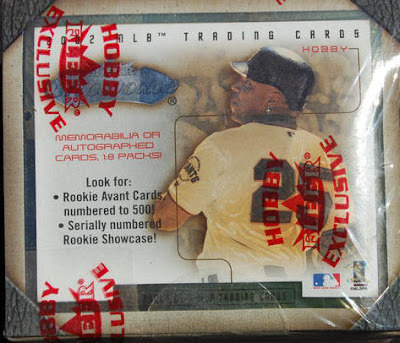 This starter box comes with one pack and a card binder. Originally you could by additional packs of 9 cards for $1.99. 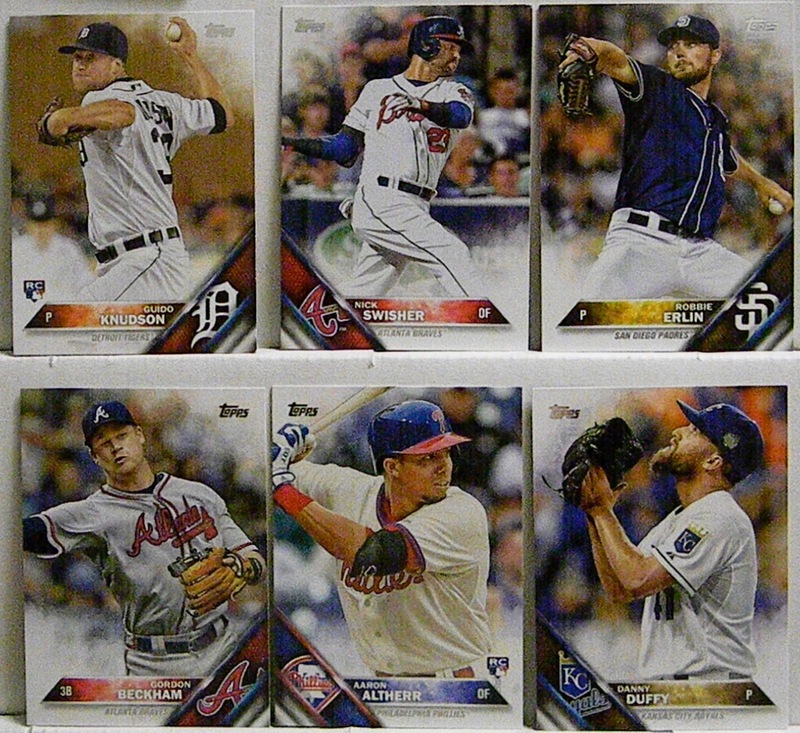 There are multiple levels and it's a little like the old Wild Card sets from the 90's. All the cards had codes you entered at Upperdeckkids.com, which doesn't exist anymore. 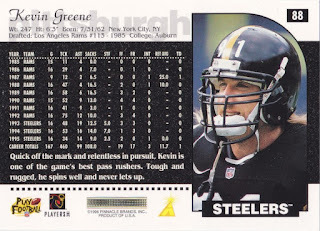 Each card also had a points value. 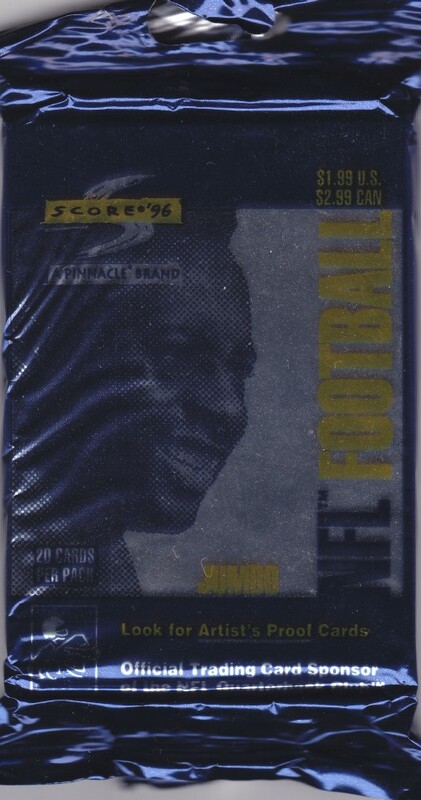 Inside the binder was a sticker with a scratch off code. There are 30 stickers in the set. 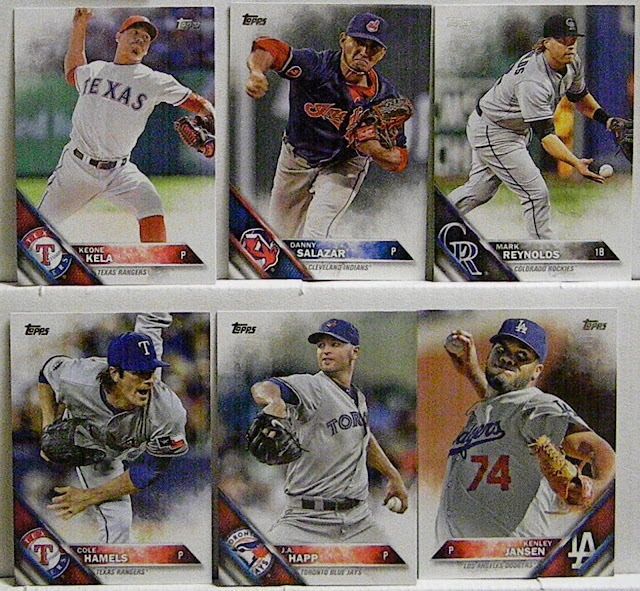 Here's a look at the base cards. The rest of the base. I got one parallel card. 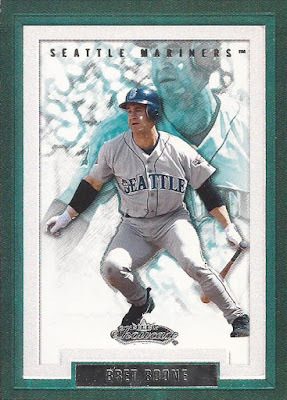 These green parallels were worth 100 points. 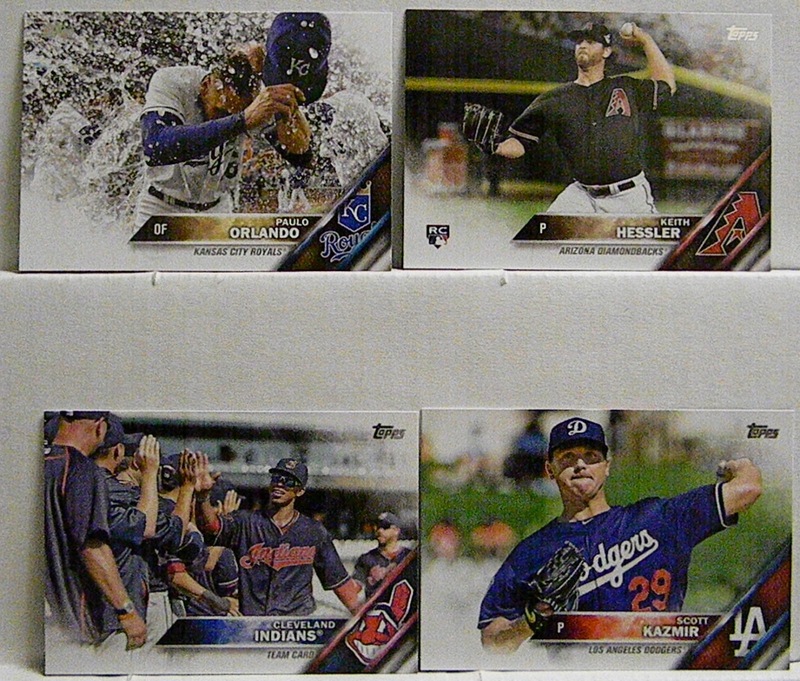 The only insert in the set besides the stickers are these Shining Through cards. No Packers, but not bad for a buck. 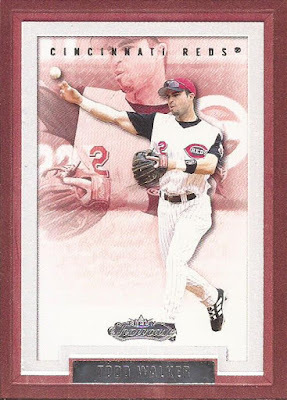 A while back I mentioned of the plethora of early 2000s cards I found. 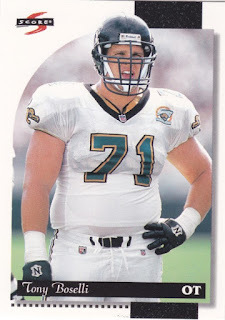 And you factor in other recent packs and I have a good 70 packs or so never before seen here. Now is a good a day as any to get one going. 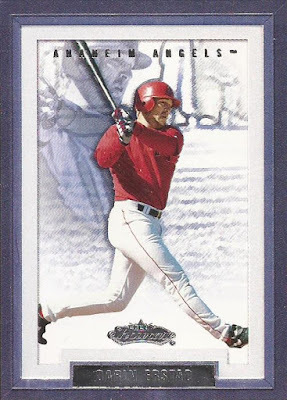 Here is a pack of 2002 Fleer Showcase. Technically, I do not have the wrapper for this pack. I found all five of these cards together in a box, so I can assume it was a stuff job by my wife who dumped the foil. so the best I can give you is an image of the box I found online. 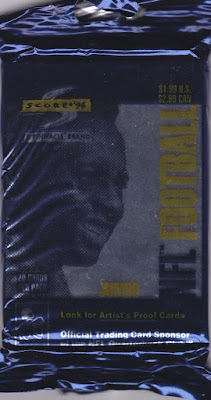 Not really a great image either, but usually you can get the idea of the wrapper from the box layout. 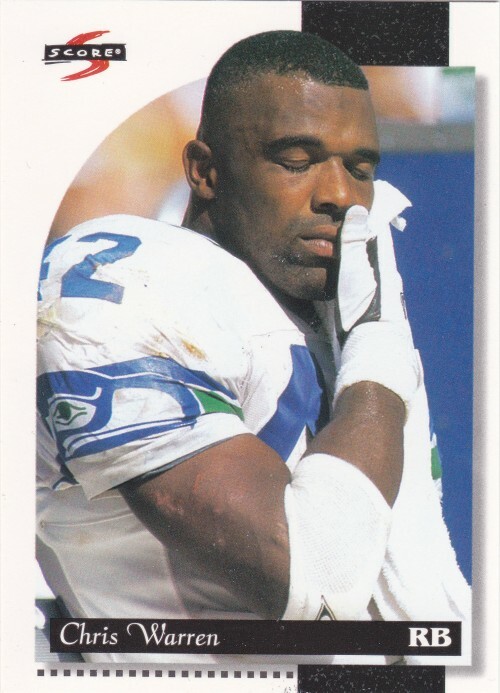 We can assume Bonds was on the pack in a pose like we see. And hey - if you want a box it's supposedly under $60 here. Not sure if that site is even still selling, as they have nothing newer than 2013, but the shopping cart still works. But you get 5 cards in a pack. The word of the day is "embossed". 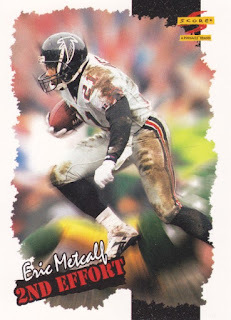 It's not "miscut" - that's just a crappy scan. 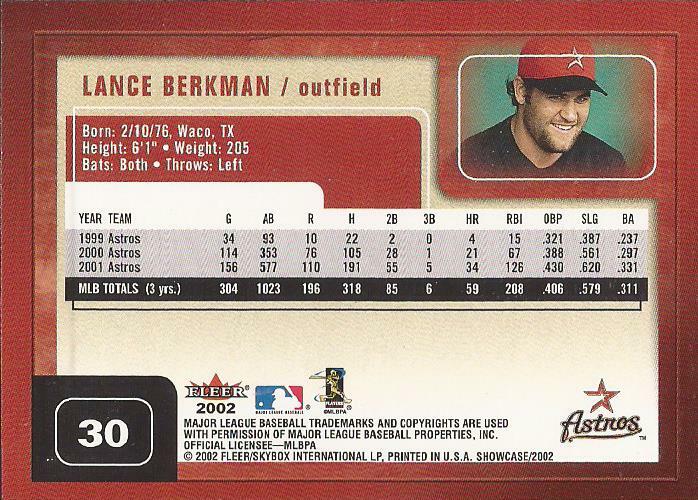 The cards have a colored frame and the images starting at the beige is recessed slightly. Foil team name you can read, but player name and branding that you cannot read. 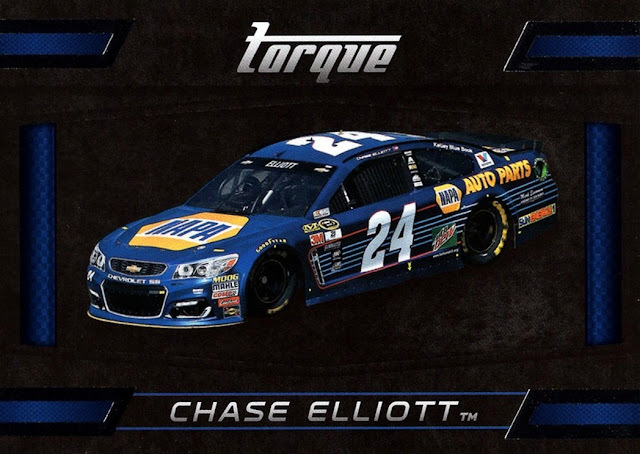 Also, the player themselves have a gloss finish over their image. 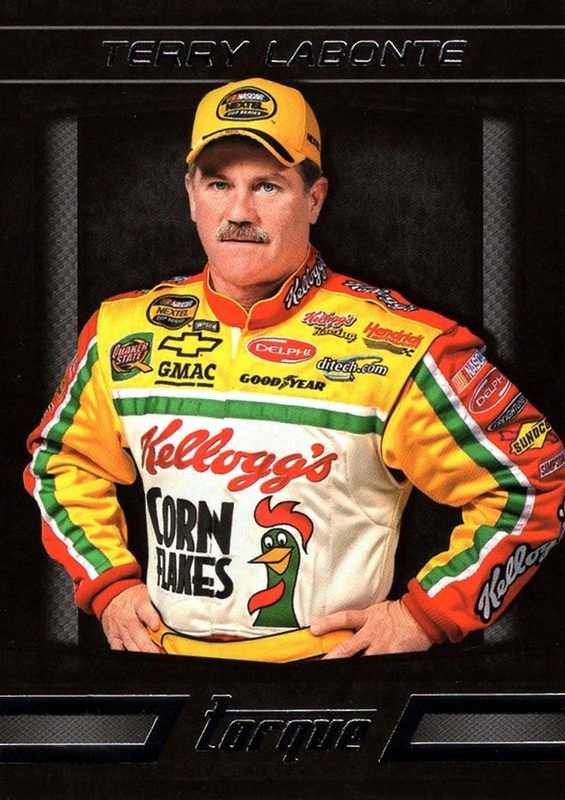 You can see the single toned duplicate picture of Sexton in the upper left over his right shoulder. And yes - different team means different border colors. 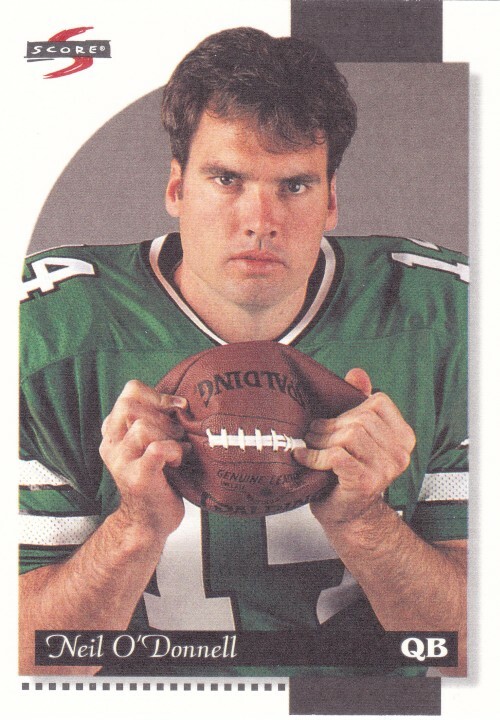 With a photo selection like this, the 2nd larger image behind Brett Boone is kinda creepy. Looks like Todd Walker is painted on the outfield wall. Good framing, though. Not sure why the Angels got a blue-ish/gray border. Sure, that was the prominent color for them in 2001. But the uniform is red, and the Angels went through a uni change in 2002. 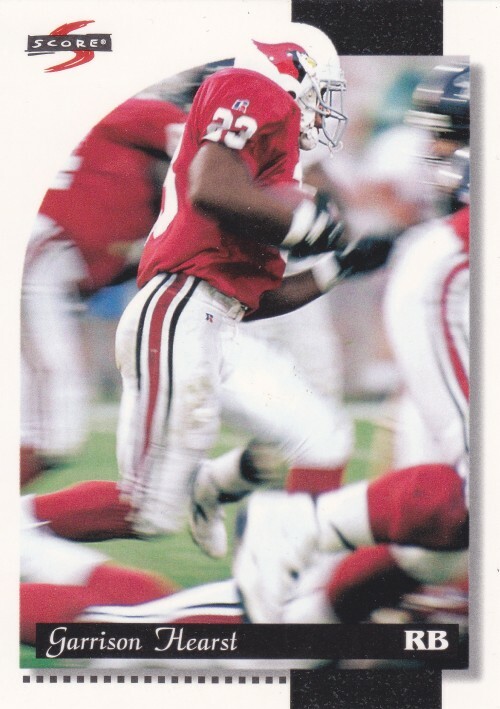 Fleer must have missed the memo. Killer B being killer. Flipside? Glossy back on the card. At least we got a new image. 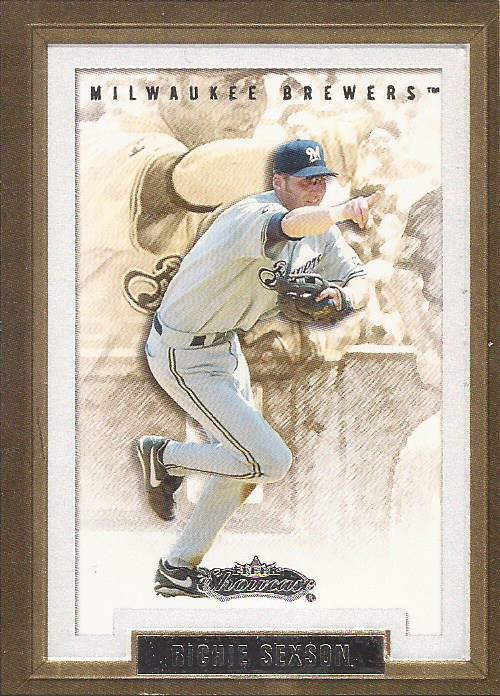 Lance was only in his 4th season come 2002. The most a player got was 5 years of stats and then a career total. Also, you can pick up the embossed front on back. It almost works in framing the back design, but looks weird in spots. Fleer also wanted to be sure you could read the number. Hope everyone is doing well. There are still times where I still cannot believe that the Cubs have won the World Series, but once the reality sinks in, I get a momentary high. And what can get me down from that high? Thoughts about whomever wins the election tonight. They're counting the votes right now (and it's closer than predicted), and while I'm sure there's a lesser of two evils, it's very hard to say which one is the lesser. I'm a fan of the strategy that comes about on Election Night (who wins which county, X can lose this state and be OK if X wins this one, etc), but still, this election is not something I was looking forward to. Anyway, let me lift your spirits again with a 2016 Topps Series 2 Rack Pack! Justin is the Upton that didn't change his name. Not being an avid watcher of Padre, Tiger, or Blue Jay games, I kept forgetting which one made the change. 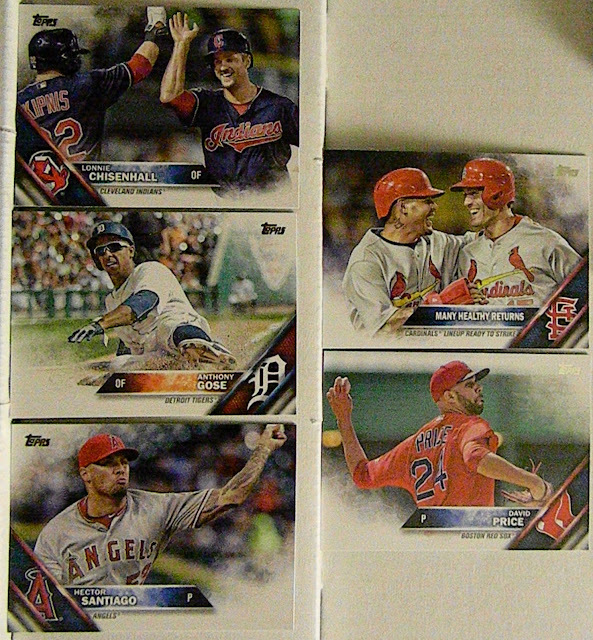 According to the back of the pack, the Rainbow Foils came 1 in 3 packs. 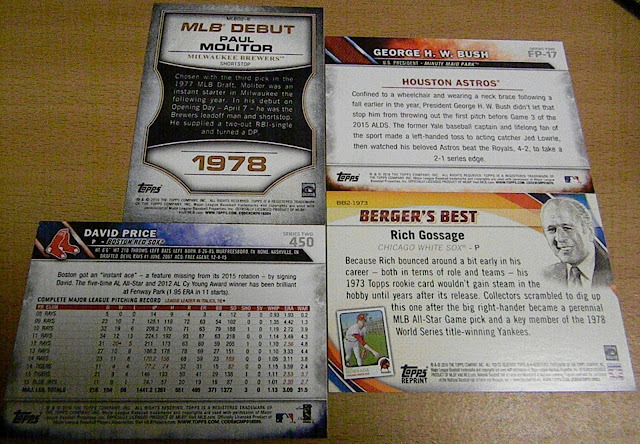 Berger's Best came 1 in 2 packs and First Pitch came 1 in 3 packs. 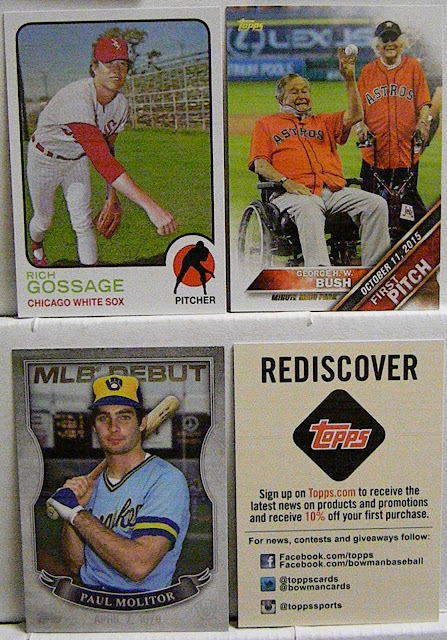 No odds were given for the MLB Debut insert. Nice selection of Goose in a White Sox jersey (sorry Berger's Best, that does not redeem your insert set). And now for the vertical cards. 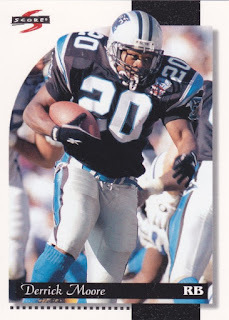 I'll say it again...nice Orlando card, but celebration cards should be a short print. Anyway, that's the rack pack. What, that didn't lift your spirits? How about some Cubs and Sherlock Holmes stripping for a dead grandma (NSFW, maybe)? Whomever wins tonight, pray for peace and unity, as the forefathers intended. Thanks for reading! 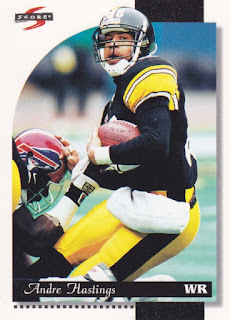 It's a Football Sunday, so I thought I'd post a 20 year pack of football cards I picked up at a card show awhile back. Because, y'know, football. 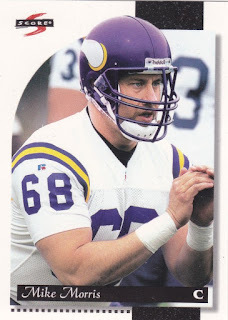 38 - Mike Morris - Serious football guy. 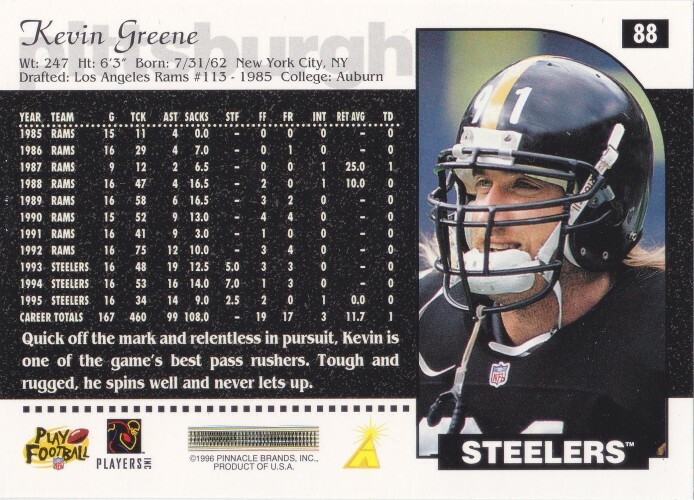 88 - Kevin Greene - Remember when they put stats on the back of cards? Score remembers. 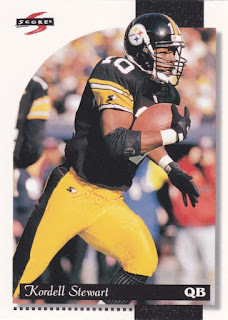 3 - Kordell Stewart - Back-to-back Steelers. 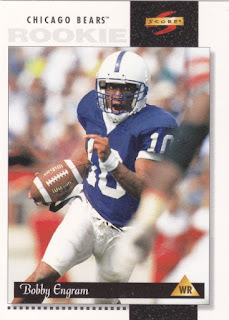 Stewart was a bit of a star for a time there because of his versatility. 57 - Mario Bates - The design is somewhat similar to Score's baseball effort from the same year, but I think this looks better. 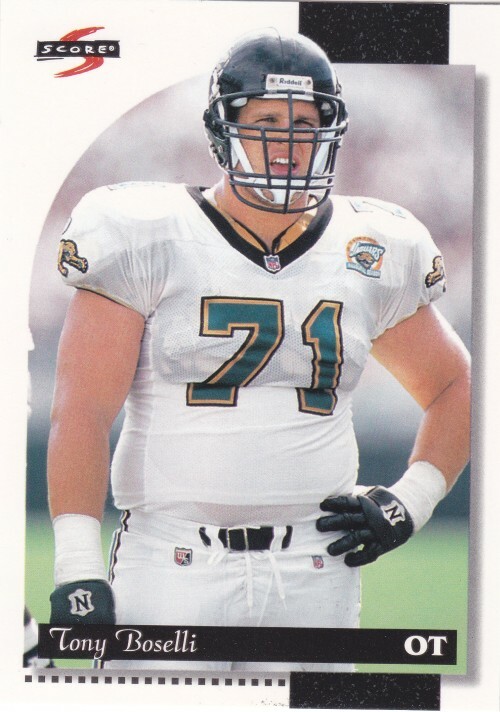 11 - Tony Boselli - The Jaguars were still a brand new franchise at this point. They still haven't figured out how to win. 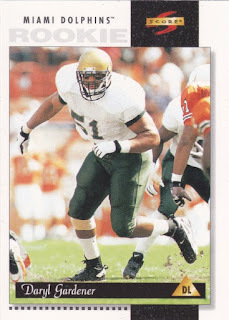 55 - Chris Warren - Here's a name from the past that I totally forgot about. He was a big deal in the Pacific NW for awhile. 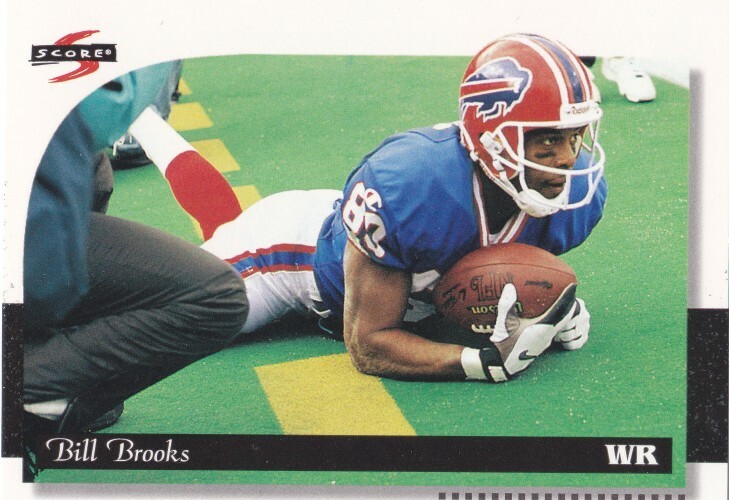 108 - Bill Brooks - Love the vertical shots. 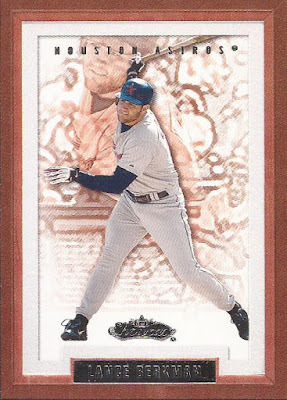 185 - Neil O'Donnell Field Force - This is a 1:3 pack pull parallel where the card has a matte finish, similar to some of Fleer's mid-90s efforts. Neil is so mad he ended up in New Jersey that he smashed the football. 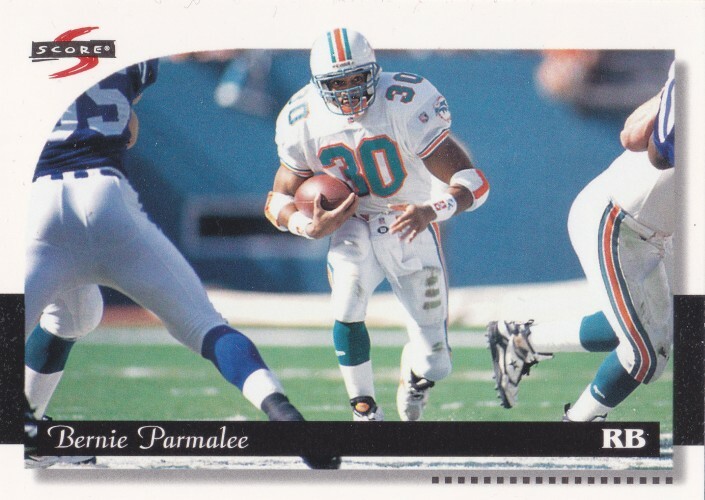 126 - Bernie Parmalee - I know this guy from Tecmo Super Bowl III. 180 - Garrison Hearst - Hearst became a star later in his career and then said some horrible stuff to the media. 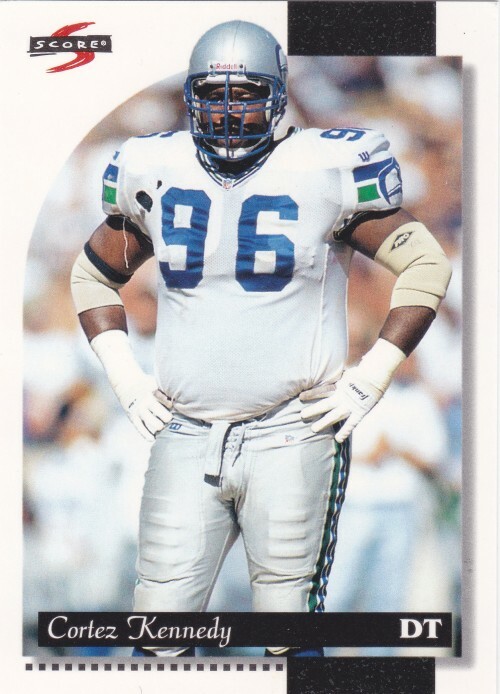 133 - Cortez Kennedy - Big Seattle star and Hall of Fame inductee. 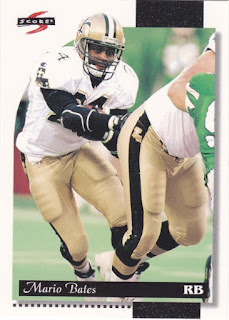 186 - Derrick Moore - Here's the other expansion team. They've fared a bit better, but have struggled since their Super Bowl loss earlier this year. 138 - Charles Johnson - Another Steeler. Generic name. 190 - Rob Johnson - You see teal, so it's probably a '90s expansion team. 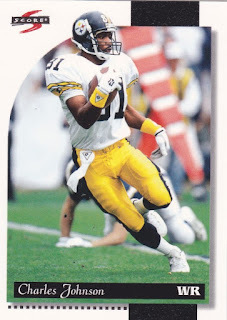 211 - Andre Hastings - So many Steelers. 152 - Charlie Garner - Here's a fave of mine. 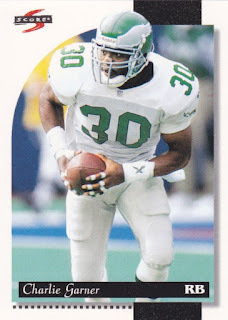 I miss these old Eagles jerseys. 256 - Eric Metcalf 2nd Effort - Metcalf was another versatile player, seen here coming off his lone 1000 yard receiving season. 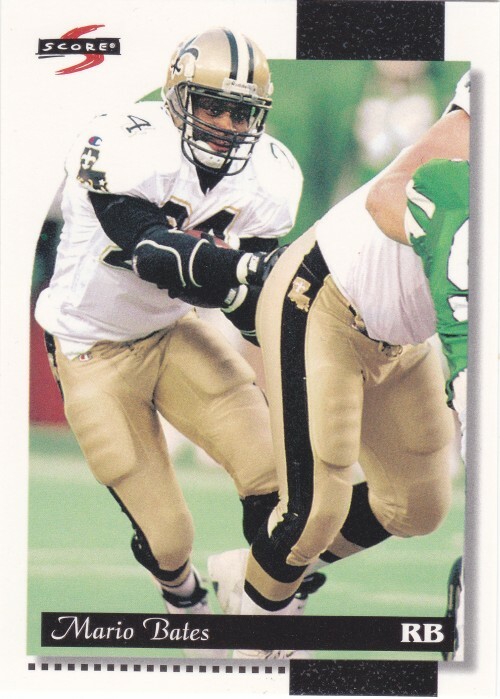 233 - Daryl Gardener - Rookie Card Alert. 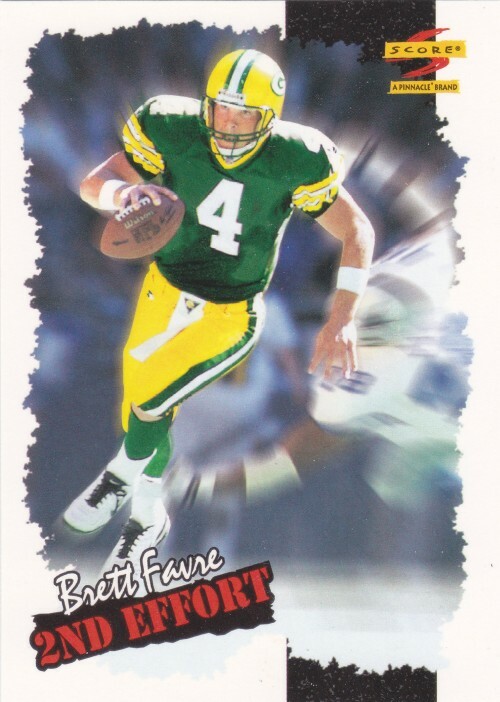 245 - Brett Favre 2nd Effort - I think he sells jeans or something? 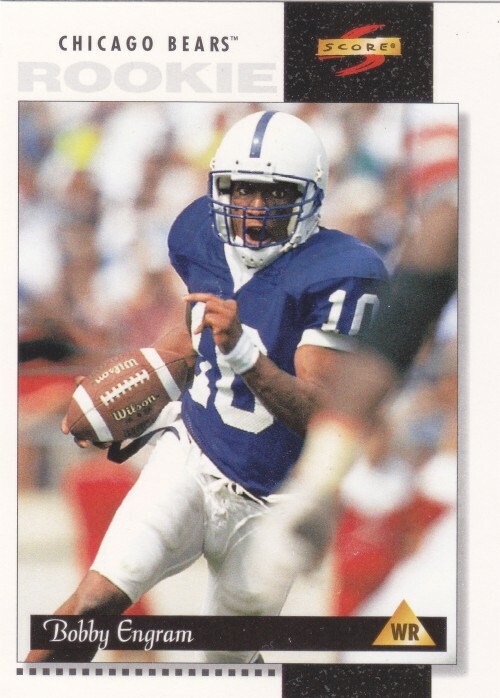 222 - Bobby Engram - Engram went on to become one of Seattle's top receivers in the Matt Hasselbeck era.